Dime Community Bank stands out for its wide reach despite its smaller size. To start, it offers a number of banking options, from savings accounts to IRAs to interest-earning checking accounts. Plus, the bank offers rates that land higher than many of its larger competitors, though you may have to pay some relatively small account fees to have access to those higher rates. Dime Bank's locations are currently limited to New York City, although those living elsewhere have online, mobile and over-the-phone access to the bank's offerings. With 27 branches and around 400 employees, Dime Community Bank has been around for over 150 years. The company first began as Dime Savings Bank of Williamsburgh. In August 2016, it became Dime Community Bank, maintaining its promise to deliver the best financial services. Today, the community bank is centered in Brooklyn with all 27 branches in the NYC area. Dime Community Bank offers a ton of different financial services from personal savings accounts to business loans. While branches are still limited to the Brooklyn area, the bank provides a number of ways to open accounts and contact customer service whether online, over the phone or via the mobile app. When it comes to savings accounts, Dime offers a number of options. There are regular savings accounts, money market accounts, certificates of deposit, club accounts and IRAs. With all these savings account options, you can open whichever account works best for you and your savings goals. Whether you’re saving for retirement, a special event or a rainy day, you can likely find a savings account for you. Savings Accounts require $1 to open. DimeDirect Statement Savings accounts require $100 to open. Club accounts require $5 to open. Access to Your Savings Account Free online banking. Security FDIC insured up to the legal amounts. Fees Statement Savings accounts charge a $4 monthly fee if your daily average account balance is under $500; Club and Student Savings accounts have no maintenance fees. Having a savings account is a great way to set money aside for the future, ensuring that it will grow and stay safe in the account. Dime offers a few different saving account options. The first is a simple Savings Account. It comes with an APY of 0.05%. This is a middling rate that’s lower than what many competitors offer (and is lower than the national average) but higher than what some big banks offer. Interest is compounded daily and is credited to your account monthly. You also must maintain an account balance of $250 to earn interest at that rate. The account also comes with a monthly fee of $4. You can avoid this fee, though, if you maintain an average daily balance of at least $500. Then comes the DimeDirect Statement Savings Account. This account carries many of the same terms and conditions of the simple Dime Savings Account. However, the DimeDirect Statement Savings Account requires a minimum opening balance of $100. This account type does provide a free Visa debit card, which is unusual for a savings account. The debit card means you can withdraw and use your savings money at stores like a checking account debit card. Dime also offers Holiday Club accounts. Dime promotes these accounts as ideal for saving for holiday purchases or special events. Club accounts also carry a 0.05% APY, with interest compounded daily and credited monthly. You can set up automatic transfers from another account into your Club Account, either weekly, bi-weekly or monthly. You do need at least $5 in your account to open one, but there is no monthly fee. Lastly, Dime offers Student Savings accounts to encourage and make it easy for students to save. For starters, there is no minimum balance or deposit requirement. The money in your account will grow at a 0.05% APY with interest compounded daily and credited monthly. Plus, the Student Savings account doesn’t come with fees for maintenance, ATM usage or point of sale usage with your Dime card. You also get unlimited free deposits and withdrawals in-person and by mail, but are still limited to the six online outgoing transactions regulated by law. Withdrawals from a Student Savings account will require two signatures, one from the student and one from a parent or guardian. That way, both student and parent are aware of every withdrawal. This requirement lasts until the student turns 18 years old. The Student Savings account automatically opens as a joint account. But if the student is 15, the account can be opened individually with parental consent. Once you graduate college, or turn 23, the account will automatically be upgraded to a regular Dime Savings Account. You should note that federal law limits you from making more than six outgoing transactions from a savings account per statement cycle. However, this limit does not apply to transactions made in-person at a Dime branch or by mail. You do have 24-hour access to online banking, so you will be able to check your account at all times. However, if you are worried you’ll go over the limit of withdrawals, you can consider setting up Savings Link Protection Service. This optional service charges you $10 per transfer, in the hopes of preventing you from going overboard with outgoing transfers. Access to Your CD As a CD, you cannot touch the account after your initial deposit until its maturity date. Then you have a 10 day grace period to make changes, either online, at a branch or over the phone. Security FDIC insured up to legal limits. Fees No service fees, but you may face penalties for early withdrawal. A certificate of deposit (CD) is an alternative to the standard savings account. The basic principle is the same, where you make a deposit into the account and your money grows according to the interest rate on the account. However, CDs come with a set time limit. You can only withdraw your savings once the term has matured. You usually cannot withdraw before the term is up without facing some heavy penalties. Luckily, there are usually a number of CD term lengths to choose from, depending on when you want access to the funds. Dime certificate of deposit options include three- to 16-month terms, an 18-month term, two-year to five-year terms and a seven-year term. To open a CD with Dime, you will need at least $500 for your initial deposit. Once you make your deposit, your money will begin to earn interest. You cannot make any additional deposits until your term is up. The bank will automatically renew your CD account at its maturity date, unless you take further action. After this maturity date, there is a 10-day grace period. During this time, you can withdraw from the account, make additional deposits or renew the account for a different term period. The interest your CD earns will depend on the term length you choose. With Dime, the shortest term of three months carries an APY of 0.10%. The longest term of seven years carries an APY of 1.60%. Interest is compounded daily and credited monthly and at maturity. Don’t forget that you cannot withdraw from your CD without facing some penalties. First, you have to have the bank approve your early withdrawal. Then the amount of the penalty will depend on your CD term length, with shorter terms losing one to three months of simple interest and longer terms losing nine to 24 months of simple interest. Access to Your Money Market Account Online and mobile banking. Security FDIC insurance; added security for withdrawals and a secured website. Money market accounts provide another banking option for those looking to save. Depending on the financial institution, money market accounts can provide debit cards and check-writing abilities. With those features, a money market account ends up being like a mix between a checking and a savings account. To start, a DimeDirect Money Market account does not carry check-writing capabilities or a debit card. However, the money market account does have a higher interest rate than a basic Dime savings account. The DimeDirect Money Market Account carries an APY of 1.20% for accounts with an average daily balance of $500,000 or less. Accounts with a daily balance of more than $500,000 carry an APY of 0.20%. Interest is compounded daily and credited monthly or on the day the account is closed, whichever comes first. Dime requires a minimum deposit amount of $1,000 for a money market account. There is also a maximum deposit limit of $500,000. There is no minimum balance requirement, though. Just remember that balances above $500,000 will have a significantly lower APY. The only other requirement for account maintenance is that you sign up for eStatements on Online Banking. There are no fees for account maintenance and paying your bills is free. As a type of savings account, a DimeDirect Money Market account limits your outgoing transactions to six per statement cycle per federal regulations. This includes payments and transfers from your DimeDirect Money Market Account. If you go over that limit, you may face some fees or the closing of your account. When you do want to make a transfer, though, the online banking system makes it easy and secure. Access to Your Account Free online and mobile banking; free Visa debit card. Security FDIC insure; secured website. Fees $10 monthly fee for a Prime Dime Interest Checking account which you can avoid with a daily average balance of $1,500. Interest-earning checking accounts are becoming increasingly popular, with Dime hopping on board with three different interest-earning checking accounts. A basic non-interest-earning checking account is also available. All four Dime checking accounts require an initial deposit of at least $25. None of the accounts come with a fee for ATM foreign withdrawals or inquiries or international transactions. Plus, you will receive 50 free checks when you open your account no matter which account you choose. The second interest-earning account is the Direct Interest Checking Account. This account also comes with a 0.05% APY with interest compounded daily and credited monthly. Luckily, there is no service fee with this account either, so your money can grow at no extra cost to you. Plus, there are no fees for any ATM transactions. You will have to set up a monthly direct deposit or ACH debit transaction, as with the Fabulous 50 Checking account. The only difference between these two accounts is that the Fabulous 50 account is described as perfect for simplifying your retirement savings goals. The third interest-earning checking account is the Prime Dime Interest Checking account. This account, unlike the previous two interest-earning accounts, has balance tiers that will determine your interest rate. Your balance is determined by looking at your daily average balance. Interest is compounded daily and credited monthly. Another big difference of the Prime Dime Interest Checking account is its $10 monthly maintenance fee. However, you can avoid this fee by maintaining an average daily balance of $1,500. Dime's Perfectly Free Checking account is pretty straightforward, especially since it doesn’t earn interest. There is no minimum balance requirement, no service fees and no per check fees. You also do not have to set up any direct deposit or ACH transactions, leaving this account available to people who do not have those paycheck abilities. Additionally, you won’t face any fees for ATM or POS usage. Access to your account Online and mobile banking, over the phone or in-person at a Brooklyn branch. You can start making withdrawals from your accounts at age 59 ½. If you make a withdrawal before that age, you can face penalties like 10% off of your withdrawal. Dime also offers the option of opening a certificate of deposit as an IRA, or individual retirement account. You may open these accounts as either a traditional IRA or a Roth IRA. The account you can qualify for will depend on your income and employment status. All the account term lengths, rates and fees of Dime’s CDs apply to the CD as an IRA. A traditional IRA saves and grows your pre-tax money. While it’s in the account, your money is free from taxation. You will pay taxes on that money when you make withdrawals in retirement. These accounts are better for people who want the tax deduction now and aren’t worried about taxation in retirement. A Roth IRA is funded by contributions you make with after-tax money. While it’s in the account, your money cannot be taxed. Additionally, when you make withdrawals in retirement, that money is safe from taxation since it was taxed before you made your contributions. This kind of account is better for people who think they will be in a higher tax bracket at retirement than they are currently. Dime promises ease and guaranteed returns when you open an IRA with it. Plus, it will handle all the paperwork that comes with retirement accounts. All you have to do is make your contributions and follow the rules and limitations of IRA contributions and withdrawals. Dime’s IRA rates correspond with its CD rates. For example, there is an 18-month term account at an APY of 1.60%. You can visit any Dime branch to open an IRA. Where Can I Find Dime? Dime began in Brooklyn in 1864 and still resides there. All 24 branches are in NYC, with most in Brooklyn and Queens and one branch in the Bronx. However, if you don’t live in New York City, you can easily open accounts online or over the phone. You just won’t have easy access to an in-person meeting with a bank representative. 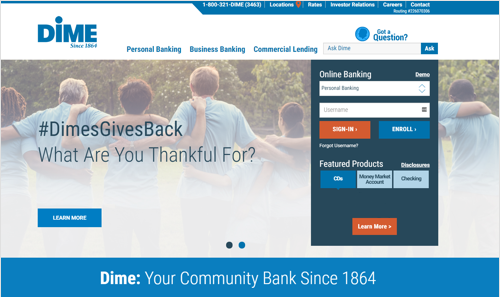 Dime Bank's online homepage is shown here. It's easily navigable, with clear choices between Personal Banking, Business Banking and Commercial Lending at the top. The bank's contact information and location finder are also easily found, should you need to speak with a representative or visit a branch. What Can You Do Online With Dime? You can do a lot with Dime online! You can open a number of accounts online. Once you’re an accountholder, you can go online to access your accounts. There, you can make necessary changes to your settings and information and move your money around as you want. Plus, Dime offers a mobile app for iOS and Android. That way you can bank on the go as well. You may access your money in a number of ways. You have easy access to your accounts with online and mobile banking. You just have to log in to your accounts and then you have the ability to make changes and manage your bills as needed. 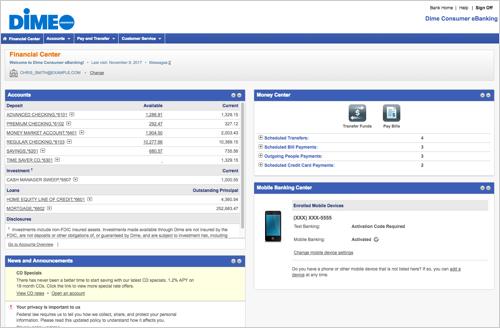 A demo image is provided here as an example of what you might see when you log into your account. Your dashboard will include an in-depth look at your accounts, a Money Center to manage your funds, a Mobile Banking Center and News and Announcements related to the bank's offerings, alerts and more. You may also visit a physical Dime branch to manage your money if you live nearby. Depending on the account, you may also be able to access your money through an ATM. This includes checking accounts and some savings accounts. Luckily, the bank won’t charge a fee for the use of a Dime or foreign ATM. While this won’t limit you, federal regulations surrounding savings vehicles does. With savings accounts, whether traditional or CDs or money market, you are only allowed six outgoing transactions. Anything over that number can incur fees or even the closing of your account. How Can I Save More Money With a Dime Account? Dime Community Bank promises high-quality financial services no matter what kind of account you open. Luckily, many of those financial services come at no extra cost to you. Even if they do, the service fees tend to be low. In some cases, you can even avoid the monthly service fee altogether. For example the Statement Savings account comes with a monthly service fee of $4, which you can avoid by maintaining an average daily balance of at least $500. With the Prime Dime Checking Account, you can avoid the $10 monthly fee by maintaining an average daily balance of $1,500. Additionally, Dime’s checking, CD and money market accounts carry rates that beat out a lot of bigger banks. Plus, three of the bank's four checking accounts can earn interest. That’s unusual for a checking account. While there are higher rates out there, especially for savings accounts, banking with Dime isn’t a bad choice. Its rates are competitive, meaning your money will still grow at a good rate. What’s the Process for Opening an Account With Dime? Opening an account with Dime works much like any other financial institution. If you have access to a branch, you may visit it to open an account. You may also call the bank at 1-800-321-3463 to open an account or ask questions. When opening an account, you will have to provide personal information. This includes your income, debt history, Social Security number, driver’s license and more. The exact paperwork and information you will need to provide will depend on the kind of account you are opening. Opening an IRA won’t be exactly the same as opening a checking account, for example. Also be aware of whether the account you want to open requires a minimum amount for an initial deposit. If it does, make sure you are ready to hand over that amount or more. If you’re looking for the highest rates in the industry, Dime Community Bank may not be for you. That being said, it still does offer higher rates than a number of bigger banks. The main drawback of banking with Dime mostly concerns those who value in-person banking relationships. For over 150 years, Dime has grown and expanded, but it still remains centered in Brooklyn. Most physical branches are in Brooklyn and Queens, with one branch in the Bronx. So if you don’t live in these areas and highly value a physical branch, you may want to look elsewhere. Dime is a solid financial institution. For one, it has resided and served in Brooklyn for over 150 years, even expanding throughout the borough and into Queens. Plus, the company's offerings cover a wide range of financial services from a traditional savings account to a money market account to commercial real estate loans and business certificates of deposit. This makes Dime an appealing choice to people who want to keep their financial accounts in one place, especially personal and business accounts. True, Dime doesn’t offer the highest interest rates. However, it does offer an interest rate on three of its checking account types which is unusual. The interest rates it offers on its CDs and money market accounts are competitive. Pair that with Dime’s low or nonexistent service fees and you have some great savings opportunities.